Some of the last vestiges of traditional Tibetan culture are under threat as Nepal’s Mustang region opens to the world. One of the most isolated regions in Asia, Mustang lies in the north of Nepal, nestled between the Chinese border on the Tibetan plateau and the Nepalese provinces of Dolop and Manang on the other. For centuries, this land has been closely linked by language and culture to Tibet. Indeed, many believe that Tibetan culture, region and traditions are at their most unadulterated here. Protected by forbidding mountains, Mustang was once an independent kingdom that controlled trade between the Himalayas and the plains of India. 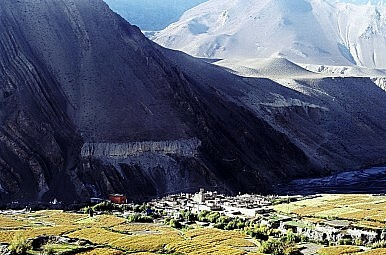 Known as the lost kingdom, Mustang is slowly beginning to feel the influence of the outside world, most notably China. For Beijing, Mustang has strategic importance, enabling it to not only exert influence in Nepal and block fleeing Tibetans, but also to reopen ancient trade routes that lead to the borders of India. Soon after Tibet’s spiritual leader the Dalai Lama escaped into India in 1959, numerous Tibetans used this traditional salt trade route to traverse arid moonscapes and plunging valleys as they fled their homeland, escaping Chinese rule. It was here that four decades ago Tibetan Khampa warriors, trained by the CIA and hosted by local Lo (Mustang) people, staged for attacks on Chinese troops in Tibet. While the Khampa’s rebellion did not last long, the free border continued to offer Tibetans safe passage into Nepal and India. In 2000, in what was an embarrassment for Beijing, Tibet’s third highest lama the 17th Karmapa Ogyen Trinley Dorjee escaped into India via the Mustang route. Since then, the People’s Liberation Army (PLA) has closed the border, blocking not only Tibetans but also local Mustang people, who traditionally crossed into Tibet to attend religious ceremonies, make pilgrimages and meet relatives. Meanwhile, Mustang lost its status as a kingdom in 2008, accompanying the end of the Nepal monarchy. Since then, the people of Mustang have come entirely under the control of Kathmandu, which has in recent years been increasingly oriented towards China. Today, life in Mustang revolves around Buddhism, controlled tourism, animal husbandry and trade. Within a geopolitical context, however, much of Mustang can now be seen in transition, and increasingly influenced by forces across the border. Local shops are filled with Chinese groceries and supplies from Tibet, which locals’ trade during an annual fair. Food is given as aid to the people by the Chinese, and some local monasteries have been built with Chinese money. For decades, China showed no interest in Mustang. Given the recent attention, locals say they are slowly becoming more worried about Beijing’s intentions. “The Chinese officers often come here in jeeps and keep a check on our activities. Sometimes they even interrogate locals asking about various things. Somehow we feel that their over-friendly nature is just propaganda,” says Pema Bista, a local living in the medieval walled city of Lo Manthang that used to serve as the capital of the ancient Kingdom of Mustang.